My Memphis Mommy: Kroger ~ Free Friday Download July 15th! Kroger ~ Free Friday Download July 15th! Here is another great freebie from Kroger you won't want to miss. 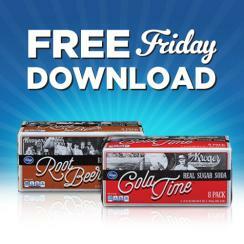 Today Only, sign into your Kroger Plus Card account and get the Free Friday Download for RECEIVE 1 FREE Kroger Real Sugar Soda (8 pk., any variety). Available in most stores. Limit 1 per household.